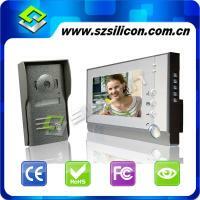 Home Companies Shenzhen Silicon Electronics Co., Ltd. Address: Rm.7E,CaiYunGe,CaiHongXingDu Building. CaiTian Road,Shenzhen,GuangDong,China. Shenzhen Silicon Electronics Co., Ltd. Plastic door machine, a classic user-friendly design, CMOS or CCD camera. Night vision function and intercom function. Image brightness, color, and ring volume can be adjusted. A variety of polyphonic ring tones are free to switch, elegant and sweet. For the warranty, we always give one year warranty when we sell the products in Chinese Mainland. However, we must apply other methods to handle the after-sale service for the oversea orders since the freight cost of international consignments can be very high. Therefore, we will provide any necessary free accessories in proportion to the foreign order quantity (1 percent) and repair manual as well as technical support. Most problems which occur during use can be repaired quite easily. So we recommend customers to resolve them locally. If there are some products which really can't be repaired, after we confirm the precise quantity of such product, we will send the agreed quantity of new products free of charge with the next delivery to compensate for the loss. door intercomwith competitive price and high quality.